This past Saturday was my sixth time racing the Clermont Draft-Legal Challenge. I have competed in this race every year since it’s debut in 2010 (minus 2013 when I was pregnant). I have finished 1st, 2nd, 3rd, 1st, 1st and this time I came away with a second place finish. I was happy to have earned a podium finish and mix up racing distances with a sprint triathlon (verses the half iron distance I competed in a month ago). This style of racing is fun, fast and produces a bit more lactic acid verses the longer distance triathlons. In draft legal racing, the race tactics can play out so differently every race and this makes each race exciting for racers and spectators. The weather was just about perfect race day. A cooler start with temperatures in the low 60s, but warmed up to around 70 degrees by race finish. Transition set up was so quick and easy and looked so bare, compared to a long distance triathlon! 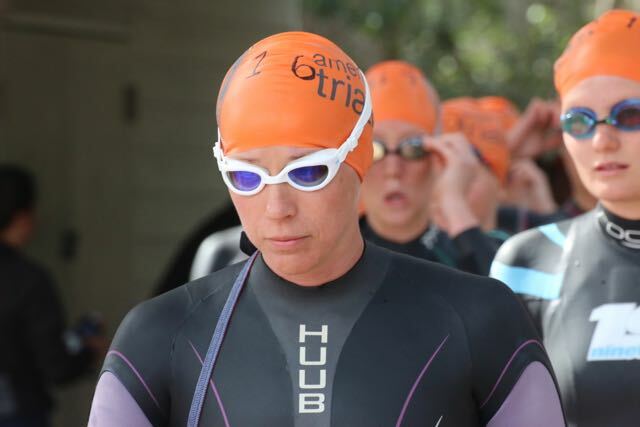 I used the following gear for the race: Triflare USA Beauty Race suit, Skechers GoRun4’s, HUUB Axena Wetsuit, HUUB Acute Goggles, Fuji Norcom Straight 1.1 with: Zipp Firecrest 404 tubular with Tangent SLSpeed Tires, Zipp Firecrest 808 Tubular with Tangent SLSpeed Tires, Quarq Elsa R Power-Meter, SRAM Force 22 components, ISM PS 1.0 saddle, Zipp SL Bars , Sampson Stratics Carbon Ti Pedals, and Rudy Project Boost 01 Helmet and Rudy Project Tryalx Orange Fluo Glasses! 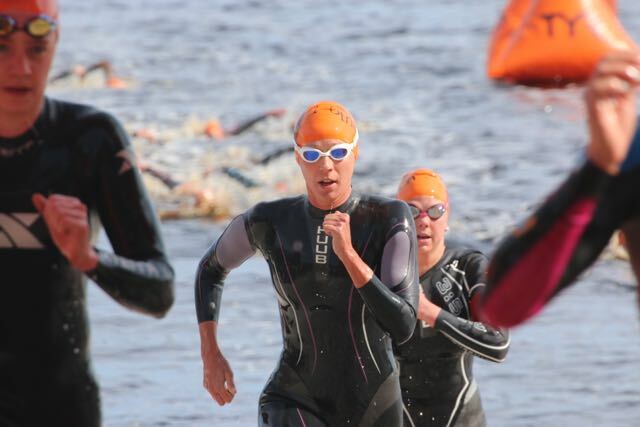 The swim was a beach start with a short run into the water, followed by an 400 meter run into the transition area. I would grade my swim start a D-. Since most of my races are deep water starts, I have gotten extremely rusty on my beach run-ins. This has never been a strength for me in the past, but in a sprint race, the start is pretty critical. After the gun went off, I found myself behind a wall of women. At 100 meters into the swim, I tried to swim through to get up to the front, but was experiencing what swimming in the masses feels like. I was dunked under water for several seconds and suddenly became hypoxic and heart rate sky rocketed just a minute into the race. I was able to get to the front after 200 meters or so and used the remainder of the swim to “recover” and swim back up close to the front. I exited the water in fourth position and felt I did not have the “kick” I was looking for to bolt through transition. I think that first minute of the race took it out of me to be able to become anaerobic again! I managed to have a decent transition and saw some women about five seconds up the road. After several kilometers into the bike, we merged as one group. After the first 180 degree turn, Taylor Knibb was still up the road and I attempted to attack to bridge up to her, but was unsuccessful to solo to attack as I brought the other four cyclists with me. Half way through the bike, Taylor attacked again. I let her gain a gap on the group and wanted to attempt the attack again to bridge up to her, but again I was not able to shake the group with me. Overall the bike was a pretty solid pace and I was curious how the legs would respond. Here is my Quarq ELSA R Powerfile presented by Trainingpeaks. 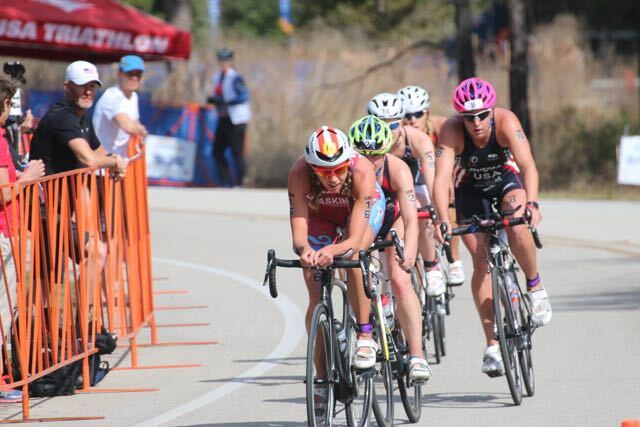 I exited the bike in first into transition and was proud how quickly I got into my shoes. I started off with running with two other women. At the first turnaround (1.25 K into the run), the pace felt like it was settling in, so I attacked and was able to narrow it down to me and Taylor. After the small surge, I feel the lactic acid build up and questioned the timing of my attack. Just after the half way point, Taylor began to pull away from me. The rest of the run, I tried to keep her within distance and focused on getting to the finish line. Taylor had an amazing race and she has incredible talent. I found out afterwards that she is only in high school…and I am almost twice her age. 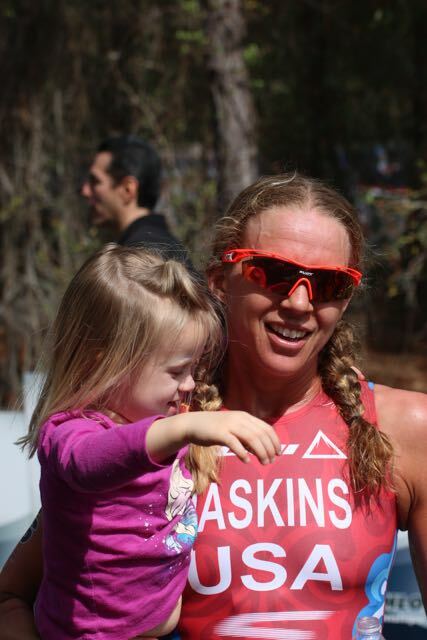 That is the cool part about triathlon…such a wide range of experiences and ages can compete together. 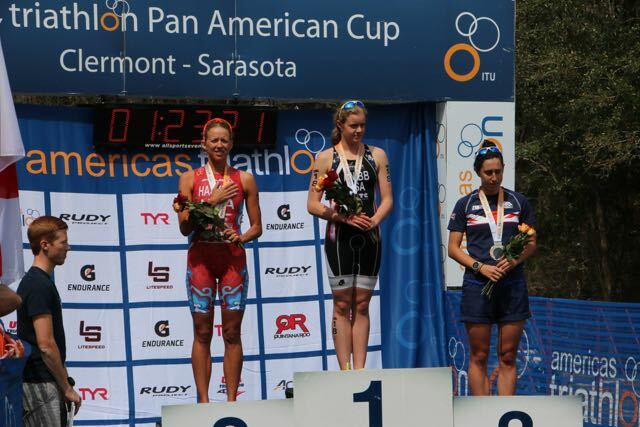 My next race is in a couple of weeks in Puerto Rico. I am looking forward to getting back to the start line, although this race will be four times in length! 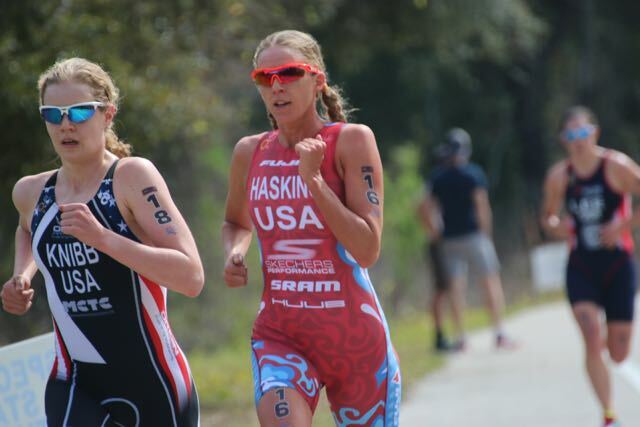 I had a blast getting to race in my backyard and see some great talent coming up through the USA Triathlon system. Thanks everyone for the support!